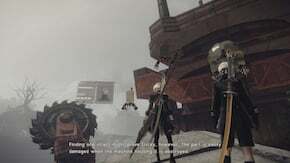 Machine Examination 2 is a Side Quest in NieR: Automata. "Gather the required materials to gain more intel from the wrecked Goliath." "The Goliath - who was named Engels - thanked you for the repairs and handed over all machine-lifeform data in his possession. With a good amount of free time on his hands, he now looks forward to future conversations. Through his talks with 9S and 2B, Engels came to realize the severity of his sins. Already at the end of his life span, he decided that death would be the best option." Use the gathered materials to repair the Goliath. You must have completed the Assault main quest, and Machine Examination 1. Go to the marked locations in City Ruins to obtain the materials by defeating Goliath Biped and Small Stubby enemies. Bring the materials back to the broken Goliath, this time it will speak properly, naming itself "Engels". It will give you over all of its data, and thank you for saving it. Come back after obtaining the Resupply quest and speak to Engels. If Engels says he's tired and must rest, the easiest and fastest way to get it to the next stage of dialogue is reloading the game. You can do this by fast traveling between access points. It's possible to complete the quest up to a certain point (exhausting most of Engels' dialogue) before obtaining the Resupply quest - however, he will eventually repeat "I am tired" after a certain point. Do not abandon the quest - proceed along the main questline until acquiring the Resupply quest, then return to Engels. To interact with Engels, stand on the ground in front of his face, e.g. in front of the ruined section of roadway, on the raised slab of concrete sticking out from the ground at an angle. Position the camera so he's in frame. A quest icon will appear in red over his head, at which point you'll be able to interact with him. There's no need to climb up the actual structure / "spiral staircase" itself. Restart your game or ps4 to make all monsters respawn allowing for pristine screw farming. If you are using Chapter Select go to Ch. 07-02. This is when you already receive the Resupply quest from Anemone. Doing this quest any earlier just results in you only completing the firstborn half and getting Record 0010 and not the second part. If you try to jump to a later chapter after already completing the first part you will have to restart the first part of the quest along with the second half in order to get Record 0020. Just transport to a different location and come back to advance the quest further each time. To get the next piece of dialogue you can just run past the factory bridge and back rather than reload.